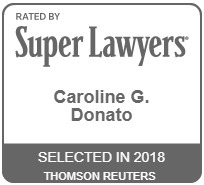 Caroline G. Donato | Criminal Defense Attorney | MacElree Harvey, Ltd.
Caroline is a member of MacElree Harvey’s Criminal Defense Practice Group. She focuses her practice on federal and state criminal defense and related civil and administrative matters at both the trial and appellate level. Whether as part of a team or as lead counsel, Caroline brings energetic dedication to providing effective, results-oriented representation for each client. Before joining MacElree Harvey, Caroline clerked for a criminal defense practice in Wilmington, Delaware. She was also a law clerk for the Office of the Federal Public Defender for the District of Delaware, a certified legal intern for the Chester County District Attorney’s Office, a News Department Intern for CBS Philadelphia, a legal assistant to several criminal defense attorneys throughout Pennsylvania, and a Public Policy Intern at the University of Pittsburgh Institute of Politics. During law school, Caroline served as the President of the Women’s Law Caucus, the Treasurer of the Student Bar Association, and was a member and competed nationally on behalf of the Trial Advocacy, Moot Court, and International Moot Court Honor Societies, as well as the Alternative Dispute Resolution Society. Caroline was also a member of and competed locally in the American Association of Justice Society. Caroline participated in and completed Widener Law’s Intensive Trial Advocacy Program. Throughout her legal education, Caroline was the recipient of the 2014 Philadelphia Trial Lawyers Association James J. Manderino Award for Trial Advocacy, the 2013-2014 Outstanding Service Award, and the 2013 Certificate of Achievement in White Collar Crime. She received Best Oral Advocate awards in local and national Moot Court Competitions, was part of the First Place Defense Team as a finalist in the 51st Annual Academy Interscholastic Mock Trial Competition, and won Best Overall Team in an American Association of Justice Competition. Prior to law school, Caroline studied Politics and Philosophy at the University of Pittsburgh. She was a member of the University of Pittsburgh Women’s Lacrosse Team and captain during the 2010-2011 season. As a Public Policy Intern for the University of Pittsburgh Institute of Politics, Caroline focused her research on Marcellus Shale and was published in the Institute of Politics Report, Issue 45. To learn more about Caroline’s practice and recent cases, please visit www.peterkratsacriminaldefense.com. Pennsylvania law criminalizing driving with any amount of marijuana in your system is unconstitutional. Here’s why. Do you have a criminal history? You may be unpleasantly surprised. Guilty: A Verdict of Fact or lnjustice? I was wrongfully accused of four crimes in which I clearly did not commit. Caroline not only saw to it that I was proven innocent, but she was always available to answer any and all questions that my family and I had pertaining to my case. To say that we are thankful for her services would be an understatement. A five-star review doesn't do her justice. This was my first offense and my first time dealing with the Chester County penal system. Needless to say, I was a nervous wreck. Caroline was extremely professional and courteous; armed with extensive knowledge of the ins-and-outs of the local laws and court system, she was able to navigate me through the process and put my mind at ease. She genuinely cares about the wellbeing of her clients and will go above and beyond to make sure you're taken care of. It was a pleasure to work with her - if I ever need an attorney in the future, she'll be the first person I call. Recently, I was represented by a shining star of the legal profession. Her name is Caroline Donato and she works for the firm of MacElree Harvey. In her presentation of my case, she took a voluminous case and wrote a brief that was clear and concise. During her presentation before the Commonwealth Court of PA, which was supposed to be 10 minutes, the judges were attentive and asked poignant questions. She never stumbled and had total command of the facts. They allowed her a generous amount of time to present her brief and in addition gave her more than ample time to rebut the opposition. Her courtroom presence I would describe as humbly respectful of the judges and confident in her case. Her confidence level was high because of the dedication she applied to the preparation of my case. The judges were in return respectful and receptive to her pleadings. This youthful legal eagle has the important attributes that make a great litigator. MacElree Harvey should be extremely grateful that she is part of their firm. Caroline was absolutely awesome to work with. I had been quite nervous being in the situation that I was in, but her calm empathetic demeanor made me feel comfortable and the outcome of my case exceeded my expectations. I am so grateful for her service and would highly recommend her! Caroline helped me out with a dire situation, without going into too much detail Caroline won me the case with her very high-level skill set that she brings as lawyer, these skills are but not limited to, her attentiveness during trials, her competitive attitude, genuine care for client and of course her very clear clean and well organized notes that she brings with her everywhere, on top of all this she always responds in a timely manner although she prefers emails for documentation purposes she will text and keep in touch with client at all times to make the trial process seem very seamless and make an already stressful situation as simple as possible! I highly recommend her to anyone whos looking to find a reliable trustworthy compassionate and strong lawyer who will not back down from any challenge and always has a plan of action in the very unpredictable legal world of our judicial system!